A true food allergy can cause you to go into anaphylactic shock when you ingest the substance to which you're allergic. Symptoms can be life-threatening and require emergency treatment. In less severe reactions, supplements may reduce your milder symptoms. Nutrients such as vitamin C can help to boost your immune system, and baking soda can help neutralize the effects of your allergic reaction. Talk to your doctor before trying any supplements or alternative treatments to make sure you don't incur even greater side effects and the substances won't interact with other medications. Vitamin C is a powerful antioxidant that can boost your immune system and kill free radicals that can lead to food sensitivities and produce symptoms similar to mild allergy reactions. Vitamin C supplements, taken with antihistamines and allergy shots, can reduce the severity of allergy symptoms when your body has a low tolerance for certain foods. However, it's imperative to avoid foods to which you are highly allergic, according to the University of Maryland Medical Center. Once symptoms become severe, you need immediate treatment, which may include a shot of epinephrine. Among the alternatives used to treat food sensitivities and mild allergy reactions, baking soda has been found to reduce the severity of symptoms when your allergy is asthma-related. According to MayoClinic.com, it's the choline, found in alkali salts such as baking soda, that reduces the severity of symptoms related to your respiratory system. Other herbal applications such as stinging nettle and butterbur can relieve symptoms as well. Acupuncture is an alternative treatment that can help restore immune functions, according to the University of Maryland Medical Center. Alternative treatments work for many allergy sufferers, but you should always talk to your doctor before trying complementary medicine to make sure the treatment doesn't interfere with any other conditions you might have. 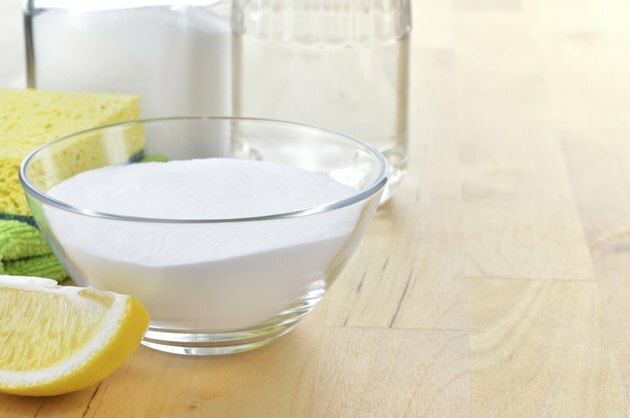 The active ingredients in baking soda, when mixed with water, primarily target respiratory symptoms by reducing the amount of acidity in your stomach and increasing blood flow to your heart, relieving respiratory distress. Allergies and asthma are closely related and often occur simultaneously, according to MayoClinic.com. When offending foods trigger respiratory distress, you experience asthma symptoms that can include wheezing, congestion, itchy eyes, rash, nasal congestion and lightheadedness. The condition is called asthma-induced allergies or allergic asthma. Some treatments, which include vitamin C, zinc and omega-3 fatty acid supplements aimed at boosting your immune system, can work for both kinds of allergies. Even organic, nutritional products may cause reactions and can exacerbate allergies. While vitamin C typically has no side effects, many vitamins are made with food products such as wheat or corn that can trigger allergic reactions. Additionally, vitamin C can interact with certain medications, such as blood thinners, antacids containing aluminum and some antibiotics. According to the Woodlands Healing Research Center, you should not use baking soda, tri-salts or bicarbonates to relieve respiratory symptoms if you have high blood pressure or heart disease because they open up sinus passageways and increase blood pressure slightly.